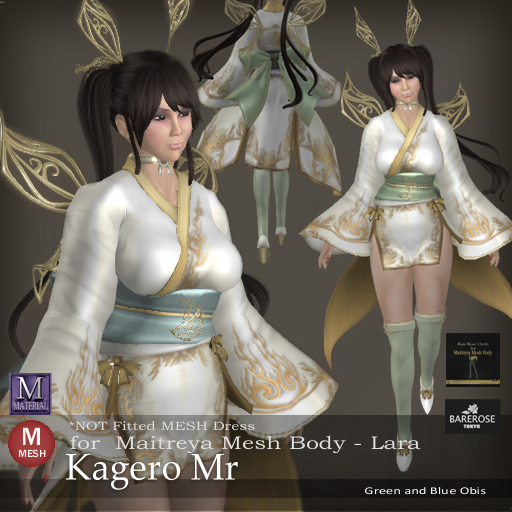 The Kagero Mr is a fairy looking outfit for the Mesh Body Maitreya Lara from Bare Rose and it comes in 2 colors - Blue and Green. Kagero is Mayfly in Japanese and you can be sure that there are cute little wings like a nice lady Mayfly in the outfit! There are even a nice head ribbon that looks just like the feelers on the Mayfly! The Blue outfit feature a light blueish tone on the ribbon belt as well as the long high boots in the outfit. But otherwise, the silk dress and sew pattern is the same for the Green version as well. There is also a version with the Boots, Ribbon and Top in Green is Blue is not your color and it does not cost you any more because it is all in the same package. Check out the other options too for other body configurations!